At what age do NFL QBs start to decline? 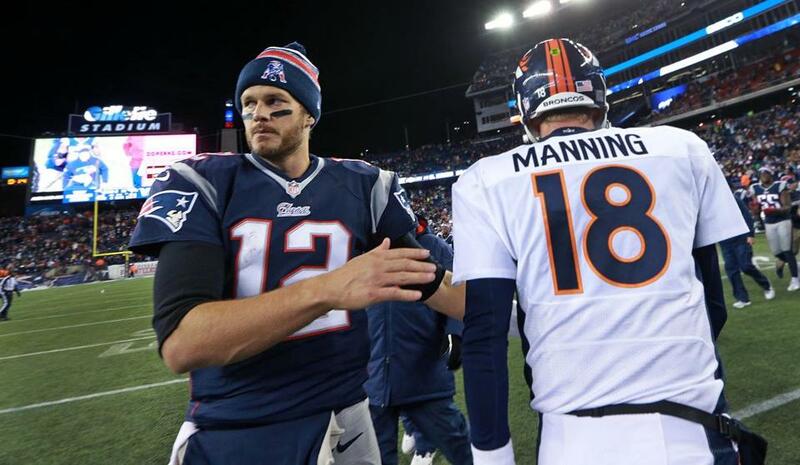 Tom Brady and Peyton Manning shook hands after the Patriots defeated the Broncos in November in Foxborough. A lot has happened since I first published this piece on age, quarterback performance, and the prospects for 37-year-old Tom Brady and 38-year-old Peyton Manning. At the time, the Patriots were 2-2 and Brady’s passing numbers were among the worst of his career. Since then, the Pats have won 11 of 13 games, thanks in no small part to Brady’s improved play. The turnaround was dramatic enough that when I dropped my son off for kindergarten this morning, his teacher asked me whether it was time to revisit my earlier analysis. This season at least, Brady seems to have largely avoided the fate of other quarterbacks in their late 30s. Whereas many become more interception-prone, Brady threw fewer interceptions this year than in any of his first six seasons. And while late-career quarterbacks often find that their passes don’t go quite as far, Brady’s average pass was longer than last year, and not far below his career average. His perennial rival, Peyton Manning, played even better. It’s true that Manning had some poor showings in the latter half of the year, including last weekend’s season-ending loss to Indianapolis, and that this drop-off has some speculating he may have played his last NFL game. Still, across virtually every major statistic — yards/game, QB rating, completion percentage, touchdowns, interceptions, and beyond — Manning outperformed his career average. For Patriots fans, perhaps what matters most is that Brady has gotten his team within two games of a championship. If he can continue winning, he’ll be the third oldest quarterback to claim a Super Bowl title, behind long-playing legends John Elway and Johnny Unitas. It’s tough to be a 37-year-old quarterback. After Dan Marino turned 37, his throws got a lot shorter. John Elway and Brett Favre had more trouble completing passes. Some of the premier quarterbacks in the NFL today are right around that threshold. Drew Brees is 35. Tom Brady is 37. Peyton Manning is 38. Sooner or later, their age is going to catch up with them. By the time quarterbacks enter their late 30s, they tend to be less efficient, more prone to interceptions, and less valuable to their teams. Very few quarterbacks reach 37 during their careers. Sometimes injuries get in the way, sometimes they’re ushered off to make room for rising talent. The better a quarterback is, though, the longer they tend to stick around, and the list of quarterbacks who’ve played through their thirties includes some of the greats. The graph below compares three of those long-playing, legendary quarterbacks: Dan Marino, Brett Favre, and John Elway. Part of what it shows is that age isn’t destiny. Some players, like Marino, do fade slowly into retirement. Others, like Elway, seem to get better in their golden years. And then there’s Favre, who was famously volatile. The statistic I’m using here to evaluate quarterback performance is called adjusted-yards-per-attempt (AY/A). It’s a variation on the more familiar yards-per-attempt, but with a boost for touchdown throws and a penalty for interceptions. That tweak makes adjusted-yards-per-attempt a more comprehensive measure of quarterback performance, and it has the virtue of working across different eras. How long can quarterbacks keep playing? Generally speaking, quarterbacks tend to peak in their 20s, but there’s a lot of variation and the quarterbacks who hold on longest—like Brady, Manning, Elway, and Favre—are a class unto themselves. To better understand the lifespan of these long-playing quarterbacks, I looked across the careers of 16 different players, from Bart Starr to Warren Moon. One thing that’s different about these long-playing quarterbacks is that they peak later. At 33, they were twice as good as they had been at 22. And they continued to play at that high level roughly until they turned 37. What happens to them in their late 30s? Well, it’s not that they stop completing passes. There is basically no falloff in their completion percentage. However, their passes don’t go quite as far. And they start to throw more interceptions. Might today’s quarterbacks avoid this fate? Possibly. The NFL is more concerned than ever with protecting quarterbacks, and that could translate into fewer injuries and longer careers. However, today’s quarterbacks are also more mobile and their penchant for leaving the pocket may actually make them more injury-prone. Anything I should know about the methodology here? • This is all based on a very small sample--in large part because there just haven’t been that many starting quarterbacks in their late 30s. Here are the ones I looked at: Tom Brady, John Elway, Brett Favre, Peyton Manning, Dan Marino, Len Dawson, Steve DeBerg, Sonny Jurgensen, Bart Starr, Vinny Testaverde, Warren Moon, Steve Young, Jim Kelly, Boomer Esiason, Dan Fouts, and Fran Tarkenton. • It doesn’t really matter that we have some great quarterbacks (like Favre) and some less-great quarterbacks (like Testaverde), because I’m not actually comparing them against each other. What I did was compare the 38-year old Testaverde with the 39-year-old Testaverde, and the 38-year-old Favre with the 39-year-old Favre. Then by putting those together, I was able to get a sense for how much the average quarterback declined between 38 and 39. • I cut my analysis off at age 39, because after that the sample size gets too small--and too sensitive to whether Brett Favre had a good year. • If you want a broader take on quarterback performance--not just for these long-playing quarterbacks—take a look at these pieces in Bleacher Report and Advanced Football Analytics.